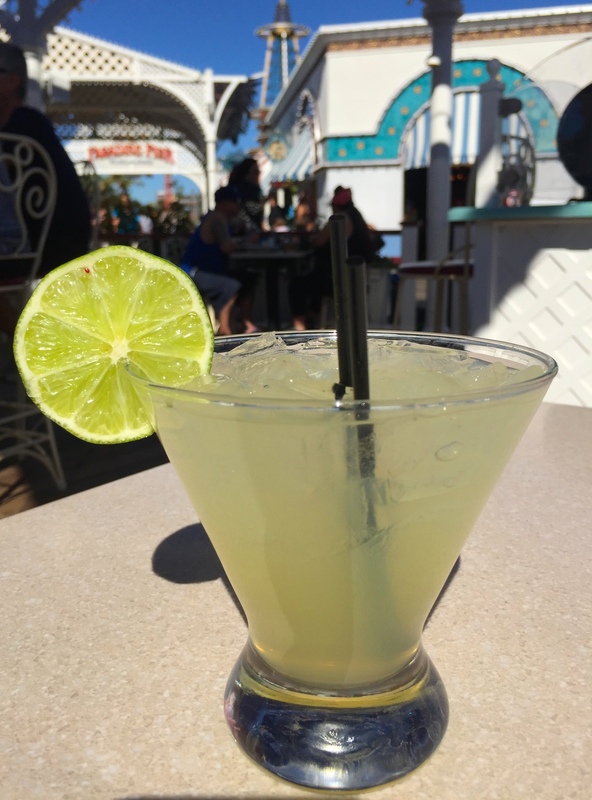 Cove Bar at Disney California Adventure is located on Paradise Pier, next to Ariel’s Grotto. It offers a view of Paradise Bay with a full-service bar. You can dine alfresco on tasty starters like flatbread pizzas, chicken wings, sliders and lobster nachos, while sipping on a draft beer, wine or signature cocktail. 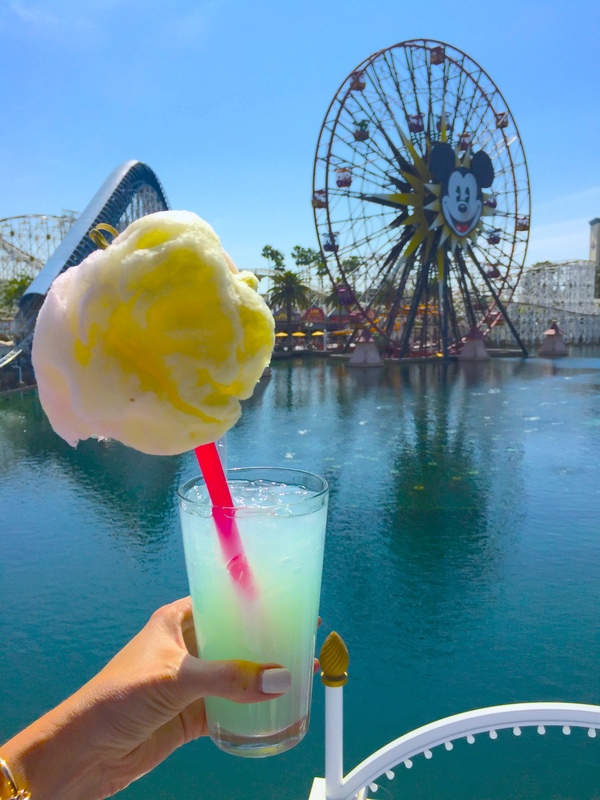 They also have non-alcoholic drinks, such as their popular Cotton Candy Lemonade. We had lunch at the Cove Bar on a beautifully sunny day so dining outside seemed like the perfect idea. We arrived right after 11 am and there was already a good sized line awaiting on tables. We ended up at a table with a view of California Screamin’ launch pad, which the kids loved. To start our lunch, I had an agave nectar margarita to sip on while I looked over the menu of appetizers. For lunch, we ordered Buffalo Wings, CB Lobster Nachos and Trio of Tri-Tip Sliders. However, Cove Bar does not have a kid’s menu. That made it a little tricky to order lunch for our two kiddos. The only kid appropriate appetizer for our group was a Margherita flatbread. The two kids split the flatbread, especially considering it was $12, but it really was not enough for two people (even little kids). Lesson learned. CB Lobster Nachos had lobster pieces atop fresh house-made tortilla chips with black beans, pico de gallo (on the side since I am not a cilantro fan), chipotle crema, cheddar cheese and fresh jalapeños. 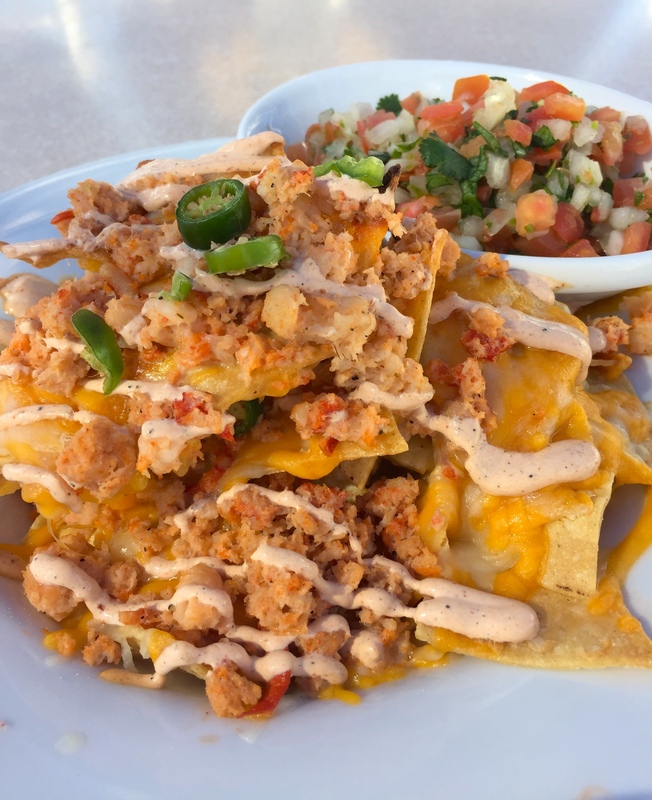 We were pleasantly surprised with the ample amount of lobster pieces on the nachos. The nachos were great! Although, there were a lot of chips underneath the mound of nachos that did not have any toppings. I wish they had been layered more thoroughly. Nonetheless, I would order this appetizer again. 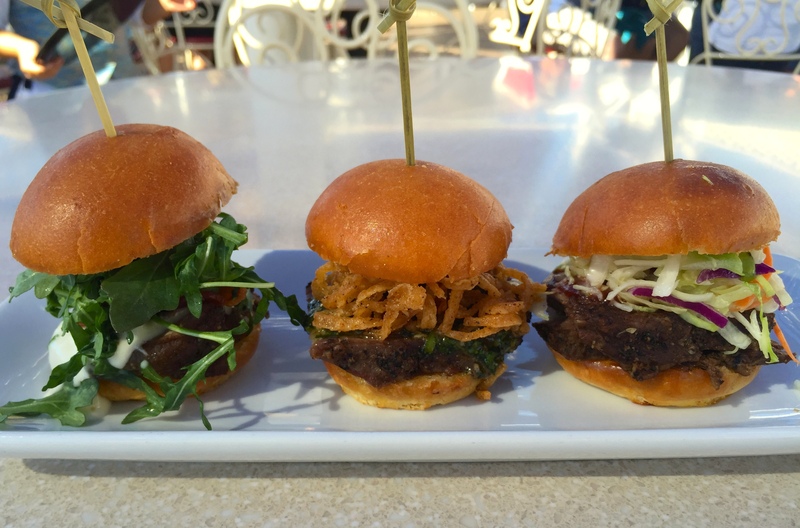 The Trio of Tri-Tip Sliders came with an Arugula, and Blue Cheese slider, Mojo Criollo with crispy Onions slider and Barbecue with Tangy Slaw Bacon slider on Toasted Brioche slider buns. The tri-tip was very tender! All of the sliders were superb in flavor. Although my very favorite was Mojo Criollo with crispy onions. Mojo Criollo is a Cuban garlic sauce and reminded me of a chimichurri sauce. I could have taken an entire platter of that particular slider. The Buffalo chicken wings ($12) were really good and very meaty. Definitely one of my favorite bar-type snacks, so I could not pass them up. That being said, we were so hungry that I forgot to snap a pic of them. But they looked like your standard chicken wings. A fun treat for is the Cotton Candy Lemonade. It is a pretty blue colored Lemonade flavored with Cotton Candy and garnished with Cotton Candy at the end of a bright pink straw. It’s not just for kids, adults would love it too! The next time I go to Cove Bar, I would love to dine in the evening and enjoy the lights from Mickey’s Fun Wheel. The kids enjoyed their flatbread pizza, but I think it is more of an adult spot. Just my own opinion.